Woke up first thing in the morning and did not feel well at all. Took out my pulse oximeter and got a reading of 66% SpO2. A healthy individual at sea level should have a reading of at least above 95%, if not close to 100%. Anything below 50% is considered dangerous levels. 66% is not a great number, especially if the plan was to subject my body to more exertion and hiking. The number did improve to 75% after sitting up and resting for about 10 minutes. Some reading on the internet seems to suggest that breathing generally slows when sleeping. It's important to rest after a full day of strenuous trekking. However over-sleeping also stresses the body in such low oxygen environments. Unfortunately I was not aware of this until much later in the trip. As promised, we changed guest house to the Namaste Hotel. The little girl came out to bid us farewell in fluent Chinese of the not so good phrases that Bo and Kilik taught her the night before. Ouch! The Namaste Hotel tho was definitely an upgrade: sitting toilets, lit hallways, and dual dining areas. As such there were a lot more patrons who stayed there. Due to the move, we started quite late in the morning. All we needed to do that day was to make it up Gokyo Ri at 5,320m and then back down to Gokyo Lakes. It was quite a short hike at 3.4km one way. However it ended up to be very very challenging, not because of the route, but because the effect of altitude was kicking in at full blast by that point. I did not feel any better as the day progressed. I was literally hiking up at crawling pace the entire duration. Every step took tremendous effort and I was already breathing as deep and as hard as I knew how to. There were many times that I thought I would not make it. As I slowly dragged myself up the mountain, the clouds came in very rapidly. More and more of the lake view was getting covered. With the difficulty in climbing up, along with the diminishing view, the thought of turning back grew bigger and bigger by the seconds. All 4 of the others were ahead of me, if not well ahead of me. In my mind I kept imagining that they had already reached the top and had been there impatiently waiting for a long time. Eventually I saw Ray only just slightly ahead of me. He kept looking back, and I assumed he was just staying back to keep tabs on me. Seeing that Ray was still within reasonable proximity helped me decide to keep going. On down hike the rest of the team were also extremely rapid. Even at my relatively slow pace, we almost passed everyone else that's also going down. I don't know how the others manage to descend so quickly, as there were plenty of pebble sized rocks that made things awfully slippery. We eventually made it down to the Namaste Hotel again. There we rejoined with Longshen, who have announced that despite him making it past the Renjo La pass successfully, he will descend all the way back to Namche Bazaar due to a lingering cough that he's uncertain whether it's part of AMS (Acute Mountain Sickness) symptoms. Sherpa Pemba will continue to accompany him and help him carry his luggage. That night I tried for the first time to cook up some hot water without paying for any. In this scenario, my stainless steel Kleen Kanteen Reflect proved to be the superior choice compared to the usually recommended Nalgene bottles. The only problem was the communal stove was only on for about 2 hours in the evenings, from around 5pm until 7pm. This was only enough to get one round of water cooked up and drank up. By the time I wanted to get a 2nd jug of hot water, the stove was off. Now that said, if everyone tried to do this, for surely there wouldn't be enough space for all the bottles. Fortunately I was not told to take my bottle off that particular evening, nor any of the following nights in the respective guest houses for the remainder of the trip. I again woke up to headache, weakness, and SpO2 reading in the high 50s. The reading later stabilized to mid 60s before a whole pill of Diamox brought it up to mid 70s by the end of breakfast. I again decided to push on despite the condition, because it was supposed to be a relatively short walk for the day. What we were walking across was the remnant of a glacier field. This meant crumbling rocks and unstable terrain. Many passages we had to go single file. Other trekkers whom were slower became blockades for us. Because of the relatively little change in elevation, frequent traffic jams, along with the wait for Ray, I managed to barely keep up with the rest of the group. Despite the slow pacing with Ray lagging, we got to Dragnag ahead of projection in under 3 hours. Bo took advantage of that and took a paid hot shower from hot water buckets. We did some solar charging and hung some items in the sun before the fog/cloud came in again. Ray did not have the best appetite and ate almost none of the lunch. I later heard that we got scold at by the lodge staff for wasting food. Later at night we ate dinner and I felt a little better after playing some Win 10. It feels good to beat Sanu at the game~ I also bought a 100MB WiFi card, just to message home that im okay, and to research more regarding AMS and max Diamox dosages. I wanted to know better to best prepare myself for what lies ahead the next day - Cho La Pass. 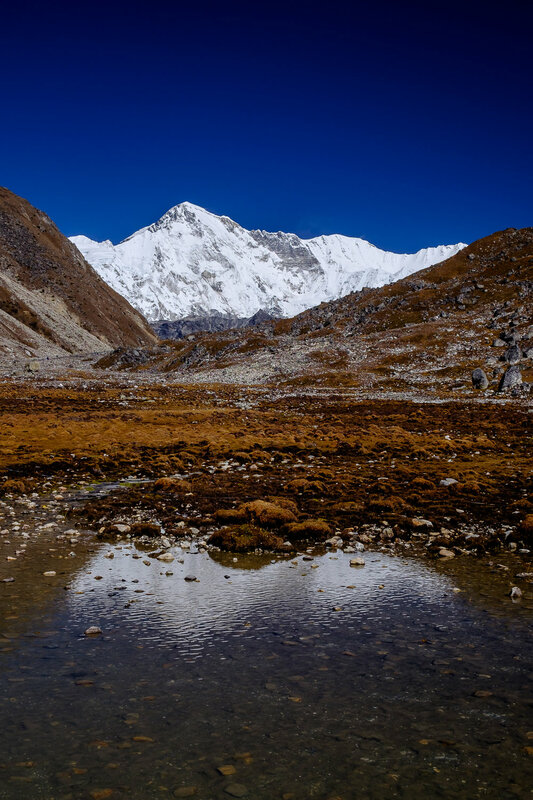 We woke up knowing that we have to tackle the 2nd high pass - the Cho La pass. However instead of a routine to hurry up and start to get going, we woke to the news that Ray felt really unwell and thought he better descend. His SpO2 reading was in the low 50s, and he was coughing incessantly. After lengthy discussions and deliberations, it was decided that Bo will accompany Ray down to the village of Pengzhen with the help of one porter. This was necessary because Ray didn't have a very good command of English, and there was no way for the last porter to carry 4 people's worth of luggage though Cho La pass to Dzongla anyways. Bo also have had been through he Cho La pass before, so the impact of missing this part of the itinerary wouldn't be as big. The hope was that Bo would rejoin us Day 11 at Lobuche to trek to Gorakshep together. Obviously Bo still wasn't very happy as he planned to make all 3 passes this trip. In my mind, I was blaming the aggressive schedule and the lack of flexibility to add more days as needed. After a hearty breakfast of the standard pre-trek garlic noodle soup, we split into 2 groups and headed into the foggy morning towards our own ways. Cho-la pass was very tough. Climbing big boulders that sometimes required tricky balancing and hopping from big rocks to big rocks. It was super challenging given the lack of oxygen, strength and the persistent headache. I barely took any photos on the way up. Comparatively, Lizhen and Kilik were going very very quickly. After some trouble navigating through the boulder field, we eventually reached the top of Cho La pass, but with me lagging by 10 minutes easily. It was a bittersweet moment, as it was only just half the team at the top of the pass, Lizhen, Kilik and I. At over 5,420m, it was definitely tougher and also higher in altitude than the Renjo La pass. Perhaps because of the fog, but I did not find this pass to be particularly beautiful, especially when compared to the Renjo La pass. Snowfield on the frozen lake just past the pass was quite unique tho. The way down to Dzongla was not short. However after getting past a little bit of snow, the sky started clearing up. The view of Amadablam right in front of us almost the entire way was very magnificent. After a difficult day of arduous trekking, the 3 of us made it to Dzongla. The attrition was demoralizing. With the cold and exhaustion, we all just wanted to sleep it all away. However only an hour into our nap, we were surprised to find Bo at the window of our room! Bo explained to us that shortly after him and Ray started descending, Ray fainted over for a minute and tumbled into a shallow ditch. Luckily Ray was not seriously injured. But this prompted them to carry Ray back up towards Thagnak for a helicopter descend instead. Helicopter arrived very quickly and evacuated Ray towards Lukla. Bo and the other porter then hurried through the Cho La pass in attempt to catch up to us. Their pacing was very quick as he started probably 2 hours later than us but arrived only about an hour after we did. Ecstatic to have more crew than expected, but saddened by the evacuation of Ray, we continued to rest up and prepared for the initial phase of getting to Everest Base Camp - the trek to the village of Lobuche.